So I’m sitting at dinner and my host decides to spark conversation with a blanket denial of global warming. Needless to say, this is not a conversation that I am used to having. Then again, it is not every evening that I am sitting across the table from an extremely wealthy, elderly, intelligent, conservative libertarian bachelor with a flair for provocation and not-entirely-pleasant self-confidence. Maybe he was worked up from our squash games at the Union Club – the second-oldest private club in the United States – where he had to buy me a set of “whites” to wear before I could go on the squash court (my plebeian pink polo was not up to code). This fellow is an interesting character: heir to wealthy Southern Jewish investment bankers whose fortune stretches back to share cropping and Reconstruction, practicing lawyer whose clients have included post-Soviet oligopolies, and confidant of conservative power players and GOP leadership. His worldview rationalizes his social status: he unapologetically parks his beliefs at his own station. While I had rather enjoyed our prior meeting and the hours of arguing about core political principles and ideological frames for analyzing policy that ensued over a dinner of coq au vin followed by cigars and cognac back at his Upper East Side bachelor pad (complete with burgundy-walled den with built-in hard-wood bookcases, studded-leather couch, chaise and bar), his challenge to climate orthodoxy made me cringe, roll my eyes and squirm in my seat a bit. I just didn’t know if I had the patience for such dialogue between bites of otherwise-delicious saag paneer. And frankly I immediately doubted the rationality of my interlocutor. He had seemed a learned man with a strident ideology with which I disagree. With one scientific conjecture he became a dogmatic anti-realist nut-job fundamentalist. I thought I had been chatting with Friedrich von Hayek only to find it was Sarah Palin all along, reading talking points from her palm. Ahhhh! Wait… deep breath… my host has been most generous to me and has consistently demonstrated his deep commitment to social thought. Of course he is not in a class with Sarah Palin. He cares deeply about history, about the future and about the philosophical principles that connect the one to the other, mindfully guiding us in the present. Moreover he has a lawyerly concern for evidence and an idealistic yearning for the truth — albeit with an over-confidence that he already has it in his grasp. So I try to open my mind to his argument — at the very least as an opportunity to shore up the evidentiary basis for my own position on climate change. What proves most interesting is the nature of the conversation itself. His argument rests on a simple, but potentially devastating, challenge to the models used by climate scientists: they do not account for the most powerful greenhouse gas, namely, water vapor. From some brief poking around on the interwebs, it appears others share and have put some thought into this critique of the core assumptions of climate change models. Indeed, according to the blog RealClimate, “Whenever three or more contrarians are gathered together, one will inevitably claim that water vapour is being unjustly neglected by ‘IPCC’ scientists.” John Cook, blogging at Skeptical Science includes this in his list of the 105 most commonly used arguments by climate skeptics. I’ll reconstruct the basics from internet sources below. Several strands of debate can get conflated here: the models are meaningless; CO2 is insignificant as a driver of climate change; activities of human beings are not driving global warming; the idea of curbing global warming by reducing carbon emission is bunk; and, by the way, there is no global warming. A careful argument would need to distinguish among these claims and take each one at time. Slippage may be allowed in a rambling dinner conversation, but it is worth noting the way that such slippage is deployed strategically in the rhetoric. A claim about other evidence for warming (e.g. temperature readings) is met with redirection to the insignificance of carbon in warming. A claim about the dramatic change in anthropogenic carbon dioxide levels in the past hundred years met with a denial that there is any long-term warming trend at all, that changes in carbon levels are relatively inconsequential and that water vapor cycles will self-correct in the medium term. A claim about other evidence for carbon being a problem (e.g. carbonic acid causing dead zones in seas and oceans) marked as a separate issue. And so on. Cook bemoans the tendency for climate skeptics to “focus on narrow pieces of the puzzle while neglecting the broader picture.” On its surface, the particular argument at hand goes for the broader picture by attempting to undermine the very foundation of climate change models. First rhetorical maneuver to note: Early in the conversation, my host discredited my personal scientific credibility by quizzing me on relative concentrations of greenhouse gases. Simply enough he asked, “what percentage of the atmosphere do you think is made up of carbon dioxide?” A fair question. Thinking back to middle school earth science I remembered that nitrogen fills the bulk of the atmosphere, around 75% (in fact 78% by mass), oxygen was 10-15% (in fact 21%), so, “let’s say, hmm, I don’t know, how about 8% is carbon dioxide.” “Much lower.” “2%?” “Lower.” “0.5%?” “Still lower.” “Okay, how much?” “Less than 0.04%” Wow. That is surprising. Moreover, the percent composition of the atmosphere of water vapor, while varying widely is on the order of 2.5%. And — while this was not mentioned at the time — it appears that water vapor blocks more long-wave radiation than the same amount of carbon dioxide. It is a far more abundant and more potent greenhouse gas. So why all the fuss about carbon emissions when the real culprit is H2O? Clearly we have been duped by Al Gore’s cabal. This sort of argument can be seen on web sites with crude graphic design (triggering prejudice against the less-institutionally-backed voices in the debate) that invite us to “take a closer look at the numbers.” [Aside on the politics of knowledge: merely by linking to such a site I am boosting its search engine rating and amplifying its voice in the public sphere. Such is the cost of transparent citation in the age of Google.] A mining engineer (read: not climate scientist) by the name of Monte Hieb asks “Just how much of the “Greenhouse Effect” is caused by human activity?” And from some simple calculations concludes: “It is about 0.28%, if water vapor is taken into account– about 5.53%, if not.” He seeks to discredit the climate models for leaving out water vapor. By combining statistics regarding the relative concentration of greenhouse gases and their sources, he reduces the possible role of anthropogenic (man-made) carbon emissions to an absurdly small amount. The back-of-the-envelope calculations seem compelling on their face. However, the data is never as neat as it is presented here and I suspect that there are a number of errors, distortions and reductions that combine to greatly undermine the credibility of these figures. Most importantly, the crude model of the atmosphere and its greenhouse effect is static without accounting for the complex ways in which different components and cycles interact to produce changes in the greenhouse mechanisms… change that can lead to, say, global warming. “Why isn’t water vapour acknowledged as a greenhouse gas?”, “Why does anyone even care about the other greenhouse gases since water vapour is 98% of the effect?”, “Why isn’t water vapour included in climate models?”, “Why isn’t included on the forcings bar charts?” etc. Any mainstream scientist present will trot out the standard response that water vapour is indeed an important greenhouse gas, it is included in all climate models, but it is a feedback and not a forcing. Water vapour is the most dominant greenhouse gas. Water vapour is also the dominant positive feedback in our climate system and amplifies any warming caused by changes in atmospheric CO2. This positive feedback is why climate is so sensitive to CO2 warming. By way of explanation of the water vapor feedback theory, RealClimate lays out some facts that reveal the fatal simplicity of an argument from simple relative proportions of greenhouse gases. The way that the greenhouse effect works is that long-wave radiation (i.e. heat from the sun that is reflected/given off by the earth’s surface) is absorbed (differentially) by particular gases in the atmosphere. Because of differences in molecular structure, these gases each absorb different spectra of long-wave radiation keeping some portion of the thermal energy from radiating out into space. (Think of yellow pigment absorbing blue light while magenta pigment absorbs green light.) But there are “overlaps in the absorbing spectra” (i.e. radiation at a particular frequency can either be absorbed by water vapour or CO2). One must ask what would happen if a given component were removed or if it were acting alone. Therefore even the static calculations above (which assume “linearity”) need to be complicated. We can get a range of the effect of each component in which the minimum is determined by the effect of removing it from the model and in which the maximum is determined by asking what effect that single component would have on its own, without any other greenhouse gases present. When this approach is followed we realize the wide range of effects that can be attributed to gases. Water vapor is indeed the “single most important absorber” but it could account for anywhere between 36% and 66% of the greenhouse effect. When we include clouds, we’re looking at 66-85%. And the effect of carbon dioxide is pegged at 9-26%. The first thing to notice is the wide range of uncertainty left from a first pass at the data. None of these estimates can be taken in isolation. The greenhouse gases are part of a complex system and the presence of each affects the concentration and effects others. Authoritative (i.e. mainstream) climate models recognize the dominant role of water vapor in the greenhouse effect but treat it as a feedback mechanism that is responsive to other changes in the system. The warmer the atmosphere is the more water vapor it can hold. Changes in temperature may be forced by other natural processes — including the greenhouse effect of carbon dioxide — and then amplified by the positive feedback of water vapor’s greenhouse effect. The reason that water vapor is treated in the models as a feedback rather than a forcing agent is that it has a relatively short “residence time” in the atmosphere. That is, water vapor tends to stick around for only 10 days or so before it condenses into water, forms clouds and returns back to earth in the form of precipitation. 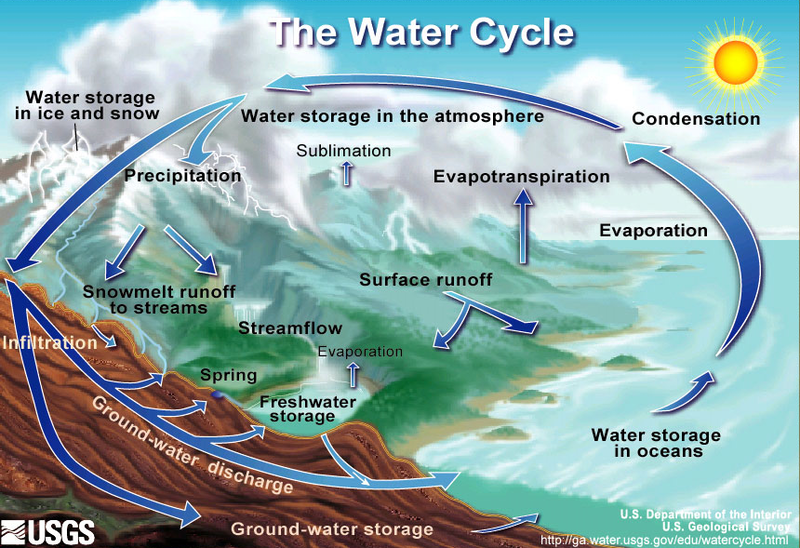 This is the water cycle that we all learned in primary school and that those of us who grew up in Seattle know all too well. Compare the 10-day residence of water vapor to carbon dioxide, which, once emitted in the atmosphere, will linger for decades to centuries before being cycled back. What this means is that H2O is in dynamic equilibrium, responding rapidly to changes in the other conditions of the atmosphere. How do we know that the magnitude of this feedback is correctly simulated? A good test case is the response to the Pinatubo eruption. This caused cooling for up to 3 years after the eruption – plenty of time for water vapour to equilibriate to the cooler sea surface temperatures. Thus if models can simulate the observed decrease of water vapour at this time, it would be a good sign that they are basically correct… [Climate scientists] found that using the observed volcanic aerosols as forcing the model produced very similar cooling to that observed. Moreover, the water vapour in the total column and in the upper troposphere decreased in line with satellite observations, and helped to increase the cooling by about 60% – in line with projections for increasing greenhouse gases. To be sure there are still some lingering uncertainties. Some recent data indicates that tropical upper tropopsheric water vapour does not quite keep up with constant relative humidity (Minschwaner and Dessler, 2004) (though they still found that the feedback was positive). Moist convection schemes in models are constantly being refined, and it’s possible that newer schemes will change things. However, given the Pinatubo results, the models are probably getting the broader picture reasonably correct. Indeed it seems that there is a great deal of uncertainty about the function of water vapor in the complex dynamics of our climate system. But the notion that it is left out of the models is absurd. It seems reasonable that the “models are probably getting the broader picture reasonably correct.” As gavin says on RealClimate, the real question is “simply the estimate of climate sensitivity for the present climate – how much would you expect the planet to warm if you doubled CO2?” And that is what climate scientists are attempting to work out as they refine their models and test them against accumulating data. And the role of water vapor is in fact crucial in this process. My response: “You see how that is a conversation stopper?” I’m not a climate scientist and I don’t purport to be. I know more than the average person about the matter and I would like to be able to have this conversation, but I don’t know the science in detail and I’m not inclined to take my interlocutor’s authority over that of the consensus of the credentialed scientific community. Given the enormity and complexity of things to know in the modern world I rely on the division of labor that tasks a group of institutionally legitimized climate scientists with figuring out what is going on with the climate — in all of its unbelievable complexity. Independent minded though I am, I rely on scientific authority. One would simply be ill equipped to mindfully navigate this complex modern world only with personally verified knowledge. And yet I am sympathetic to the will to be intellectually independent and ready to buck authority when called for. For example when it comes to economics I am less willing to defer to mainstream academic experts. I am willing to call into question the project of professional economists not because I claim to understand the intricacies of their econometric models but because from the outside there appears to be major problems with the social theory underlying the models and because policies driven by this economic ideology have resulted in catastrophic failures. Likewise, a radical challenge to scientific orthodoxy on climate change might convince me to annul my trust in the experts. The claim that water vapor is not included in climate models could rattle my faith… if it had any legs. From what I can tell, as sketched above, water vapor is definitely a key part of the models. Moreover, the accounts I have read and partially reconstructed offer reasonably compelling explanations for why the models treat H2O as a feedback rather than forcing agent. This suggests that the mainstream of climate science is flowing in the right direction and that climate scientists are arguing about the right kind of things armed with a wealth of data and familiarity with nuance that I will never have the pleasure of bringing to this topic. My host was gracious enough to follow up on our conversation some weeks later after another game of squash (I had my whites this time). He recalled saying “I know the science” and that I had called him out on his “conversation stopper.” Then he assured me that his intention was not to stop the conversation by insisting on the infallibility of his conclusions. Rather he “just wanted to have a discussion about the science itself” rather than taking the orthodox answers for granted. Which I appreciate, even admire. From the little I know — and all the more so I after writing this post — it is clear to me that climate science is anything but simple. That is precisely why he and I are not in a position to have a meaningful debate about the merits of particular scientific conclusions. As outsiders — notwithstanding his claim to familiarity with the literature — the only debate we can have is whether or not the scientific authorities can be trusted. We can inquire into what the public must demand from the scientific community. It seems to me that the most important demands we can make of science is that the practice consist of topically relevant conversations conducted according to the norms of credible institutions. The public should be aware of the basic problems confronted by the scientific community and should be convinced that these investigations and debates are focused on important problems and taking into account all salient knowledge. As far as the norms of the practice, there must be assurance of credibility by way of the integrity of individual scientists, of the institutions that facilitate and constrain their work, and of the checks and balances at work in the community for internally vetting knowledge-claims. The imperative for the content of science is intellectual and potentially politico-theological; the second is both cultural and structural. We should stand ready to challenge scientific communities on both fronts and to demand reform where necessary. One could make the point that my calculations are ‘just another web page’ no more and no less authoritative than the links above. In some sense that is correct (though I’d argue my sourcing is a little better!). But you will never find a peer-reviewed rebuttal of such a bizarre line of reasoning as we are dealing with here – basically because such a line of reasoning is highly unlikely to make it past peer-review itself. There are innumerable ‘proper’ references to estimates of the climate sensitivity though, and one should indeed hesitate to accept calculations like this example over the mass of peer reviewed studies. Science depends on peer-review for its success. Indeed, arguably, science is peer-review. It is a communal practice for vetting theories much more than it is a method for individual inquiry into the depths of nature. Enlightenment mythology surrounding science makes this hard to accept. We want our scientific knowledge to be objective, completely independent of human subjective biases. There is no criterion for assessing the objective truth of knowledge-claims. But there are norms to which we can hold our scientific community to account so that the sociality of science serves to produce something that transcends individual whims and supports the public’s need for useful knowledge. Because science is a social practice, it can go awry. So “peer-reviewed” does not necessarily mean “true.” But in a healthy academic culture embedded in a democratic society it should mean “to the best of our knowledge.” And that is what we as a people have to work from as we deliberate collective action. Scientific skepticism is healthy. Scientists should always challenge themselves to expand their knowledge and improve their understanding. Yet this isn’t what happens in global warming skepticism. Skeptics vigorously criticise any evidence that supports man-made global warming and yet eagerly, even blindly embrace any argument, op-ed piece, blog or study that refutes global warming. Often, the reason for disbelieving in man-made global warming seem to be political rather than scientific. Eg – “it’s all a liberal plot to spread socialism and destroy capitalism”… However, what is causing global warming is a purely scientific question. Skeptical Science removes the politics from the debate by concentrating solely on the science. Skeptical Science is maintained by John Cook [who] studied physics at the University of Queensland, Australia… He is not a climate scientist. Consequently, the science presented on Skeptical Science is not his own but taken directly from the peer reviewed scientific literature. To those seeking to refute the science presented, one needs to address the peer reviewed papers where the science comes from (links to the full papers are provided whenever possible). There is no funding to maintain Skeptical Science… no affiliations with any organisations or political groups… strictly a labour of love. Mr. Cook is engaged in an honorable project, but I question whether it is truly as cut and dried as he claims. I doubt that there is such a thing as “solely the science.” Science is what scientists do, and what scientists do is, in part, a political question. There is politics at work in cultivating and policing the norms the guide and constrain scientific practice. Cook gives a nod to these norms by being transparent with his own limited credentials, deferring to the peer-reviewed literature and insisting on direct citation, and disclaiming the sort of outside funding of political affiliation that might skew his commitment to “the truth” — accurate understanding of how nature functions — knowledge useful to the general public rather than to special interests with agenda-driven strategic deployment of knowledge-claims. These are attempts to insulate the politics of scientific culture from the other political arenas, cultural predilections, and economic forces in our society. I stand with Enlightenment visionaries on the value of this project. And yet, as I have noted, peer-reviewed science is only as good as the integrity of its peers and the norms of review. And climate science has come under sharp attack on these terms in the past year. Skeptics have gone right for the credibility of scientific authority on climate change by focusing on failure of scientific integrity and breakdown in norms. Most notably “Climate Gate” arose from the publication of hacked e-mails from University of East Anglia. According to the Economist (3/20/10), “They revealed an unwillingness to share data which broke the spirit, if not the letter, of Britain’s Freedom of Information Act, an aggressive attitude to the peer review of papers by opponents and an apparent willingness to hedge science in the face of politics.” This compounded with errors by the IPCC such as a recent report that mistakenly claimed that the Himalayan glaciers were doomed to disappear as soon as 2035, rather than the projected 2350. A huge difference and obvious reporting error. While bolstering his unorthodox position, my climate skeptic dinner host alluded to these stains on the record of mainstream climate science, adding that career scientists have a strong material incentive to hype the problem of climate change so that institutional sources of funding like the National Science Foundation will keep pumping money into their studies. If there were no problem, there would be no need for intense and urgent study, which means less need for tenured positions, research centers, grants, etc. This is a separate challenge from the sort of content-based objection considered above. Indeed the counter-conventional water-vapor theory depends on some basic scientific consensus to paint its contrarian picture. And yet the general discrediting of scientific practice gets folded into the polemic. These positions can be easily resolved, but the slippage between them does not bode well for discursive clarity. How bad is this? Sceptics point out that each mistake has tended to exaggerate the extent of climate change. The notion that the scientific establishment has suppressed evidence to the contrary has provided plenty of non-expert politicians with an excuse not to spend money reducing carbon. So the scientists’ shameful mistakes have certainly changed perceptions. They have not, however, changed the science itself. If the Economist had written something similar about economic scholarship, I would wave my arms in protest at the implication that there is a solid, objective science at work independent of the foibles of scientific practitioners and their ideological group think. However, I think the most sensible way to read this is that the scientific community remains robust enough that a few “bad apples” have neither brought down the overall project, nor seriously impugned consensus positions. But the serious challenges to the credibility of the scientific community prompted an investigation by the Economist into some notable challenges to the orthodoxy — a more thorough and expert version of what I attempted to do above. Indeed they specifically consider the water-vapor objection and reject it. The Economist reviewed the science in view of recent criticism and concludes that “most research supports the idea that warming is man-made.” If anything, the ideological bias of the publication is against government intervention in the economy. So I am heartened by their strong endorsement of a scientific position that suggests the need for massive intervention (through a market-based model like cap and trade, of course). Plenty of uncertainty remains; but that argues for, not against action. If it were known that global warming would be limited to 2°C, the world might decide to live with that. But the range of possible outcomes is huge, with catastrophe one possibility, and the costs of averting climate change are comparatively small. Just as a householder pays a small premium to protect himself against disaster, the world should do the same. Such an approach may, in the short term, have encouraged some voters to support measures to combat climate change. But implying that Britain’s children face some sort of Saharan future is wrong, and dangerous. Point taken. But can the same said for, say, Sub-Saharan children? There are urgent threats to be confronted. And while uncertainty abounds, the stakes are extremely high. It is not dishonest to portray just how dire things could become without our action. It is, however, irresponsible and self-defeating to suggest that catastrophe worldwide looms in the very short term – I don’t know, say, 2012. Our reasons for acting must be with an eye to the long-term health of our planet and the people living on it. Not an easy political sell in the face of pressing problems affecting people now. But who said saving the world was easy? Advocates for sustainable policy need to cultivate a politics of limited knowledge that embraces action based on our best resources. The standard for “actionable intelligence” cannot be absolute certainty in a case like global climate change. To demand this of our scientists would be unreasonable and would cripple progressive democratic politics. The flip-side is the acceptance of the responsibility to oversee the norms and structures of the scientific community to ensure that they continue to work in the public interest. I appreciate skepticism. But it is not of a piece with epistemic humility. We desperately need to be guided by the limited knowledge we have about the global climate and the effects our civilization has on it. As a democratic people we must not take scientific experts as infallible authorities, but it behooves us to defer to them within certain parameters of reasonableness. We demand epistemic humility from them with our skepticism and we embody it ourselves in our deference, which derives not from a priestly authority granting scientists special access to objective truth, but from a division of labor committed to advancing our democratic civilization. The scientific values I hold require that we give up the easy comfort of certainty. Your man is interesting. Instead of declaring himself an authority and sounding dismissive, he could have said things like “research indicates” or “the data suggest”. You learned from his position even though you didn’t share it, resulting in an article that is a model of the principle of charity. By switching your focus to the conversation itself, you turned what could have been a useless standoff into a fruitful examination of scientific discourse. And fwiw, I think you were just as verbose as necessary. I’m skeptical and practice epistemic humility, but I’m not afraid to say that we do know many things. Since the science is fairly recent, climate change disputes can resemble religious ones, which “largely traffic in beliefs that stand outside of easy evidentiary evaluation”. I share your division-of-labor approach to accepting the claims of science, keeping in mind that this is a practical move that will occasionally misfire. Science is the worst way we have to understand the world, except for all the others. Thanks Don. I wish I could read, think, and write as fast as you! Love the Churchill paraphrase. It is apt precisely because science is in the same position as democracy in terms of navigating being without sovereign direction outside of the human community. Of course democracy has to grapple with moral positions. And I do believe in the value of a scientific practice that strives to restrict itself descriptive causal accounts of the world. Yea, I’m an Instrumentalist regarding science. I avoid making ontological conclusions from science; although in a few areas, like quantum mechanics, we pretty much have to be zeroing in on what nature is doing. There’s no self, no purpose, no meaning and introspection is completely unreliable.